Nick and Mitch and their dad went hunting on Saturday and brought back pheasant and chucker breasts. 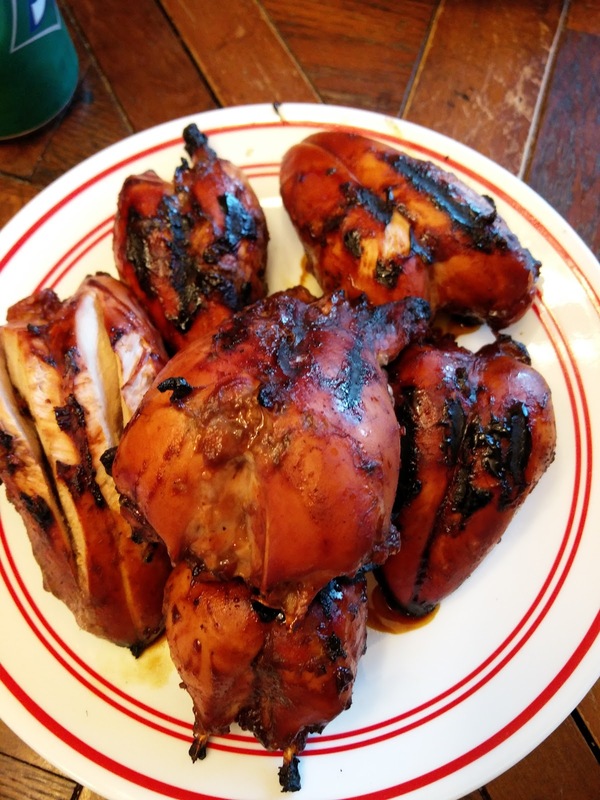 So, today we made pheasant and chucker breasts marinated in barbecue and cooked on the grill. For sides we made carrots and asparagus that were first steamed, and then grilled. 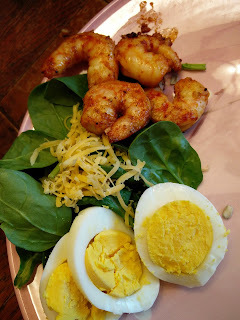 We also made a shrimp side salad with baby spinach. 1. Combine the bird breasts and barbecue sauce in a gallon sized ziplock back for about 4 hours. Use enough barbecue sauce to cover the breasts in the bag. 2. Pre-heat grill on medium high. We have a 3 burner grill - we put 2 side burners to maximum and middle burner to medium, and the birds will go on the middle burner. 3. Cook breast side up (the bone side down) for 8 minutes. 4. Flip and cook for 10 minutes breast side down. 5. Lower middle burner to low and flip the breast side up again - cook for another 5 -10 minutes to keep warm while the sides finish cooking if necessary. 1. Steam carrots and asparagus for 15 minutes. 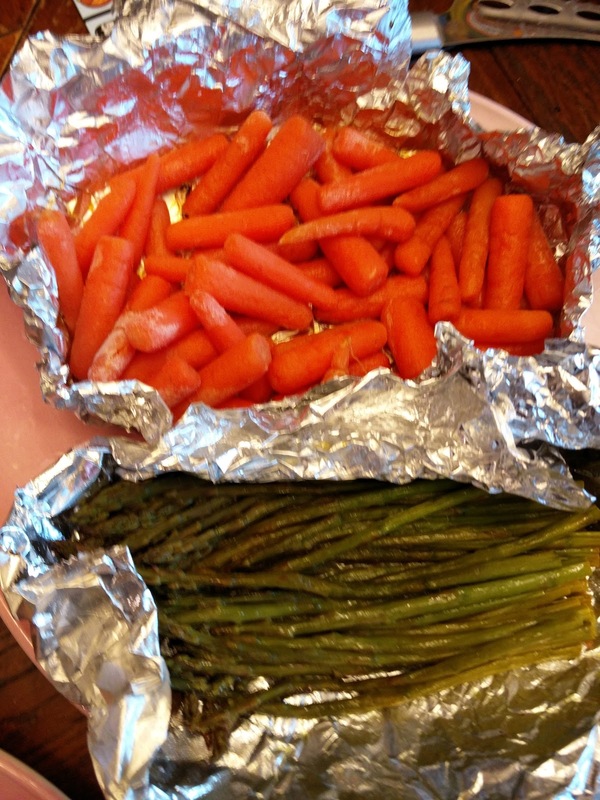 We use a multi-cooker that has a steam option and wrap carrots in a piece of foil and asparagus in a piece of foil. They can be steamed together. We would suggest doing this while the grill pre-heats. 2. Move the carrot and asparagus filled foils to the grill to one of the sides (with maximum heat). 3. Squeeze half a lemon into each foil. 4. Add a tablespoon of butter and a tablespoon of olive oil to each foil. 1. Heat a frying pan. When it is hot, put the 2 tablespoons of butter on it. 2. When butter stops bubbling, put shrimp onto the hot pan and spread them out. 3. Put salt, pepper and paprika on the shrimp and cook for 1 minute. 4. Add chopped garlic to the pan and cook for 1 more minute. 5. Flip the shrimp, and cook for 2 minutes. 7. Mound spinach on each plate. Divide evenly between plates. 8. Add sliced boiled eggs, sunflowe seeds, and grated cheese to each mound. 10. Combine all ingredients for the dressing in a bowl and whisk together with a fork or whisk. Divide out to each plate. 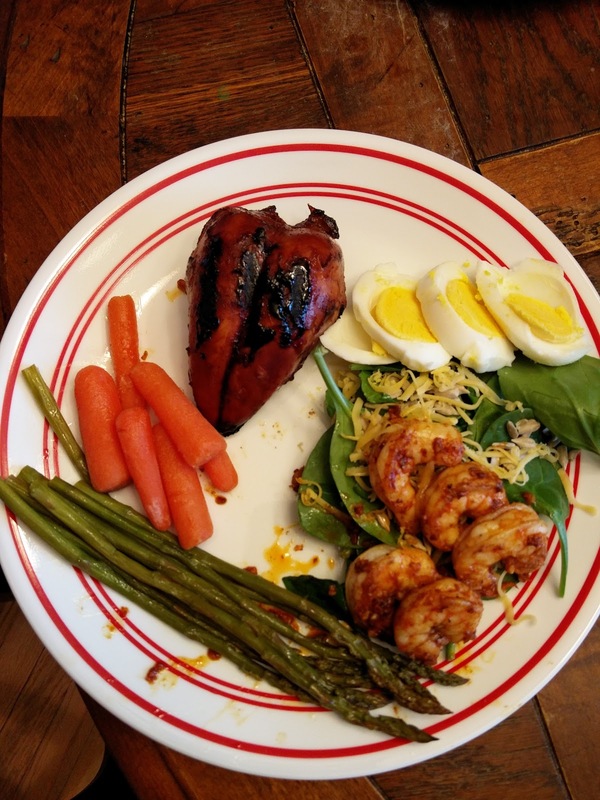 It was the easiest and best wild bird recipe yet. The breasts turned out tender and delicious. The lemon on the asparagus and carrots was great and the side salad was very good and light. He liked the egg yolks and cheese and carrots. Wouldn't really do anything different.